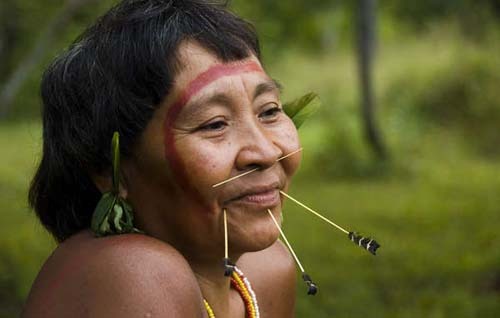 As the year draws to a close, Survival International’s new photographic gallery illustrates how tribal peoples around the world had reasons to celebrate in 2013. - In Brazil, a community of Guarani Indians celebrated after the government recognized their land as indigenous and for their exclusive use. The Guarani have lost most of their land to cattle ranchers, soya and sugar cane plantations and their leaders are routinely assassinated. - The shocking story of the Awá, known as Earth’s most threatened tribe because their forest is being logged at an alarming rate, reached millions of people worldwide after images of the Awá by renowned photographer Sebastião Salgado appeared alongside features in Vanity Fair and Sunday Times magazine. Since the launch of Survival’s Awá campaign, over 55,000 protest emails have reached Brazil’s Minister of Justice urging him to evict illegal invaders on their land. The Dongria Kondh made their voices heard during community consultations which unanimously rejected a mine on their land. - Survival’s call for a boycott of Botswana tourism resulted in three travel companies suspending their tours to Botswana over the mistreatment of Africa’s last hunting Bushmen. While promoting tourism to Botswana with glossy images of the tribe, the government is driving the Bushmen off their ancestral land and prevents them from hunting. - In India, tribal people made their voices heard after the Supreme Court ordered unprecedented community consultations with the Dongria Kondh over an open-pit bauxite mine on their land. All villages overwhelmingly rejected plans by the British mining giant Vedanta Resources in their sacred Niyamgiri Hills. - And the new ‘Proud Not Primitive’ campaign in India – which challenges the deep-seated prejudice that tribal peoples are ‘backwards’ and ‘primitive’ – celebrated an important victory after the Hindu, one of the largest English-language newspapers, pledged not to call tribes ‘primitive’. World-renowned Brazilian photographer Sebastião Salgado documented the plight of the Awá, Earth's most threatened tribe.